One of the amusing stories in this connection concerns a passenger who requested ice cream at 1600 of our first afternoon underway, homeward bound. The operator of the Ship’s Service Store ice cream plant informed this passenger that the ice cream was sold out but that some more was being mixed which would be fairly hard by 1900. The passenger replied as follows: “As long as I have waited two years for ice cream, I guess I can wait another three hours.” So, like waiting to purchase a ticket to the World Series, the Marine waited until he got his ice cream, though he missed his dinner to do it. 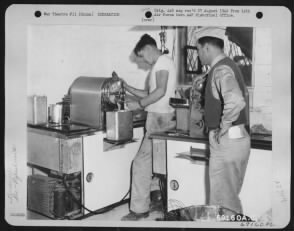 Lines of men waiting for ice cream became so long that they interfered with the cleaning of the mess hall and crew’s compartment. Owing to this the ice cream stand is opened only for a few hours each day. We have managed to shorten the lines by reducing the sales of ice cream by the scoop and by putting it in quart cartons and #10 tins. […] For one man to eat a quart of ice cream is common; for two men to polish off a #10 tin, a little more than three quarts, is not unusual; but six passengers had the largest appetite who, between them, have been reserving a five gallon container every day for the past four days. Yesterday two of them dropped out but the four remaining took their five gallons of ice cream without turning a hair. So when we say food will win the war, we, of course, mean the term to include milk and ice cream. A Distinguished Service Cross and an extra scoop of bran for the contented cow. Love ice cream too? Find more stories and photos about ice cream in the military by searching for “ice cream” on Fold3. In 1968 when I reported aboard the FBM submarine USS JAMES K POLK SSBN 645. One of my first duties was what we in the Navy called “mess cooking”. This duty was a totally unpleasant task of cleaning and being a go-fore for the galley for two weeks. In civilian life I had been a refrigeration repairman. When I repoerted to the galley for my mess cooking duty. I found that the soft serve ice cream machine was not working. After a discussion with the leading petty officer of the Aux gang that I was to report to after my two weeks of mess cooking, It was decided that my first duty was to repair the machine since the Captain (Commander Peter Durbin) was very fond of his evening desert of soft serve ice cream. I repaired the machine and was pleasantly surprised that my stint of mess cooking was over by direction of the Captain. He really di like ice cream!! This story of the Kitty Hawk has brought back fond memories to me. I went aboard the USS James K. Poke on 14 November 1997 as a guest and spent the entire day and early evening. We went out into the Chesapeake Bay and had a delightful time; diving was thrilling, just as I had seen in the movies. My brother-in-law, Emil Popa, was retired from the Navy and had served on many submarines. He retired in the early 1970’s, and was looking forward to this excursion on a sub once again. He died in September so I went on the ride with his widow, my sister, Carol Popa. We enjoyed a nice breakfast, delicious lunch, but I don’t recall that we had ice cream. I am going to sit down later today and read all that material that I received from J.E. Johannes, Jr., Commanding Officer of the USS James K. Polk (SSN 645). I’m not sure of my dates but I believe that by the time you visited the “polk” that she had been converted from a fleet balistic missle (FBM) to a fast attack boat with SEAL DELIVERY Capabilities. I was on board in 1968 when she was an FBM. In 1996 I accepted a position with a company located in Chesapeake Virginia (which is just south of Norfolk) We located or home in a community called Great Bridge. Soon after moving there I was in the local “SAMS CLUB” and noticed a Chief Petty Officer wearing a ball hat the said “USS JAMES K. POLK 30th Anniversary” I told him that I had served aboard and when. He took off the hat and gave it to me. I never got to thank him properly. I still have the hat. Some time after that I read that the POLK had been decomissioned. I am now retired in the mountains of North Carolina and have many rememberances of the POLK. My dad, P. (Philo) N. K. (Pinky) Englesby, was in the Navy from 1939 to 1945, as a chief petty officer pharmacist’s mate on submarines, mostly in the Pacific. He volunteered for submarine duty after surviving the attack on Pearl Harbor on 12/7/41. Subs, at least the modern types then with refrigeration & A/C, were able to keep ice cream on board for crews to enjoy. After being discharged, dad went back to Mondovi, Buffalo County, WI and shortly after opened up the Eagle Café, later named Philo’s, where the main attraction was good, old fashioned, homemade ice cream. He hoped to make a good living for his growing family making and selling his own real ice cream, but, unfortunately, the advent of household refrigeration forced him out of business, and he had to become a cop. But dad really liked real ice cream, and I think he may have learned to love it on the subs, where, he often said, they had the best and most food in the service. Nice, aboard the USS Comte De Grasse we converted a forward storage unit to a very small ice cream/popcorn shop. This brought a small piece of home with us making long deployments better for the crew. Sailors are the most inventive people on earth. commissioned in 1961. Navy shows no other ship named Kitty Hawk. On 25 Jun 1941, civilian passenger ship Seatrain was acquired by the United States Navy and converted into a transport and aircraft ferry by Tietjin & Land Dry Dock Company of Hoboken, New Jersey, United States. She was named Kitty Hawk on 8 Jul 1941. She was commissioned on 26 Nov at New York Navy Yard with Commander E. C. Rogers in command. After shakedown cruise, she departed from New York, United States on 16 Dec 1941, carrying aircraft to replace those lost at the Pearl Harbor attack. April 1948, Debarking our troop transport and loaded in Army trucks. We were taken to the mess hall, our first meal on the “wind swept ” Island of Adak in the Aleutians Islands included ice cream for desert. We would learn to appreciate it, though it was made from powdered milk. It tasted like canned milk. Thank u Mr Polk, Mr Bob dose not know his military history. ……I have a lot of respect for the Navy, and I will tell you why: …. [ I am a very proud Viet Nam Vet,] during my tour,67 68 aug. we ( the 1st Cav) DIV were told we would be moving to I corp’s 22miles from the dmz. some where between, Hue, [whey] Phubi, and a few more I still can’t pronouse and with all our equipment, and the very dusty, and oil slik mined road, we were loaded on to L.S.T’s , for our three day[ sea sick] voyage to Danag, which at that time one of the largest military bases, to un load, which took one more day, of hurry up and wait,we were finially able; to streach our legs, and eat in a real mess hall, wiyh [REAL] food, what came next was a sure DELITE……ICECREAM and all u could eat, and that was the one and only time I had this wonderfull , wounderfull treat ,in that whole year,and 2 day’s , and this was in march of 1968, …..When my tour was over, and on the way home the air-port to my home, my dad asked what I would like to eat, my response was….2 CHEESE BUGER’S FF, AND A CHOCOLATE MILK SHAKE. In my response, I misspelled “Polk.” I apologize. In 1956 I was assigned as a radio operation on RC-121’s flying picket patrol out of Otis AFB on Cape Cod. We had ice cream in our small galley. Ours came in individual bricks, about 3x3x1 indivedually wrapped. In the 17+ years on flying status, that year was the only time I had ice cream. If I can find a way to send you a picture I’ll send you a picture of a ships patch. At one time there was a memorial /museum in pineville (south of Charlotte) for JKP (his birth place) I do not know if it is still there or not! My email is shmiller48@frontier.com = I will reply with attachments of POLK. I also will send a copy of the patch. Don’t know how, except by e-mail if you want to send. I could try to describe but would not be able to do adequately. If you are on facebook. I have pictures posted their. send me a friend request! If I knew how to do that, I would be glad to do so! Are you registered on facebook? Look me up on facebook. Steve Miller. I have pictures of the Polk and a ships patch in my photos. At night when movies were being shown top side on the fan tail. “Gedunk” and “bug juice” (cool-ade) brings back memories. What does “Goo gaw’ mean to you? My husband, James J. Simpson, served in the U.S.N. from 1944-1946. He was a radioman 3 on the submarine Plaice. He was in charge of making the ice cream, He said he was very popular. Jim died in 2011. I miss him and his sub stories. As you know sailors set there own priorities. Abandon ship with only things that are needed, Ice cream was one of there priorities!!! I’m very sorry for Jims passing and your missing him! I had a colege professor that served on submarines during WWII. He became like a second father to me. (Thurman Milam).He has also passed on. They left a great legacy and a very big hole in many lives. God Bless them and the ones they left behind. We will all meet again!!! I read this story about the ice cream & the U.S. military. My Dad is (86) yrs. old & a World War 2 U.S. Navy Veteran in the Pacific Theater. He does not speak of his service & being a history buff I can understand why. To all men & women who served, thank you for your service to this country.